Players collect sets of illustrated Train cards which are then used to complete Destination Tickets - routes between two cities depicted on each ticket. But before their Train cards can be used, players must face the risk of "train-robbing", where another player may force them to lose their hard-earned cards. Every fan of the board game will want to own a copy of the Ticket to Ride Card Game! 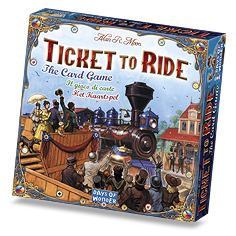 The Ticket to Ride Card Game is for 2-4 players ages 8 and older. It includes 96 Train cards, 6 Big Cities Bonus cards, 46 Destination Tickets and a rules booklet. Playing time is approximately 30 minutes. The Ticket to Ride Card Game is the perfect portable way to take your next train adventure!